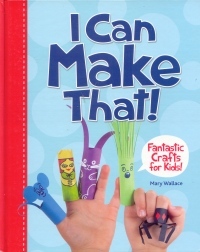 CM Magazine: I Can Make That: Fantastic Crafts for Kids. I Can Make That! Fantastic Crafts for Kids. Toronto. ON: Owlkids Books, 2014. This book is filled with amazing crafts you can make. It's easy. It's fun. And you'll find most of what you need around your home and outside. The craft ideas can also be used to spark your imagination and start you thinking about how to invent your own creations. The 2014 edition of Mary Wallace's book I Can Make That! 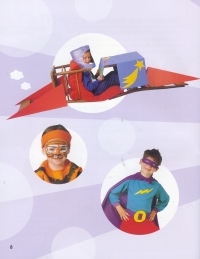 Fantastic Crafts for Kids is an update from the 2002 edition. The verso states that this new edition contains material that has previously appeared in I Can Make That! Fantastic Crafts for Kids (2002), I Can Make Costumes (1996), I Can Make Puppets (1994), I Can Make Crafts (1996), I Can Make Toys (1994), and I Can Make Gamess (1995). A quick comparison of the 2014 edition to the 2002 edition shows that the majority of crafts in this new edition were featured in the older book. Nonetheless, this most recent edition does have some other unique elements, including an introduction section, patterns and a material index. Crafts in the book are divided into five sections. The first section focuses on costumes and provides 16 ideas ranging from a full superhero costume to a simple mouse ears hat and tie-on nose. The second section deals with puppets and provides 12 crafts, including string, sock and finger puppets. The third section is about nature and lists eight crafts, including cornhusk dolls and a potted moss garden. The fourth section features toys and includes 13 crafts, such as clothespin racing cars, twist tie people, and a dinosaur puzzle. The final section focuses on games and showcases 12 activities, including board games, a tangram game, and a felt "trip kit" for car rides. Vivid, colourful photos of each craft make the book visually pleasing but also serve to assist crafters with their projects. The photos are particularly helpful considering there are no measurements given for crafts, such as the costumes and some of the paper crafts, which might otherwise benefit from them. There are tracing patterns at the back of the book for six different crafts. The written instructions that accompany the various crafts are numbered, and the writing is simple enough for children to read and follow. One of the most helpful features of this book is the alphabetized materials index at the back. It lets you look up common household items, such as orange peels, aluminum foil, paper bags, and buttons, and find a creative craft to make using them. In general, most of the materials needed for the crafts in this book are relatively cheap art supplies that one could buy at any local arts and crafts store. Each craft starts with a handy list of materials needed to complete the project. Many of the crafts in this book will require adult assistance. There are some simpler crafts, like the finger puppets and pet rocks, but the majority of the crafts involve multiple steps, many different materials, and a certain amount of precision that might be difficult for younger children. For this reason, this book would work well for daycares, classrooms, community centers, and libraries. Kerry Macdonald is a librarian at the University of Manitoba in Winnipeg, MB, and the mother of two boys, aged 5- and 9-years-old.